I just listed on Ebay 7 examples of the extremely rare 1913 E244 McBride-Rothschild Silent Film set. 2 of the 7 examples newly discovered, and had yet to be cataloged! 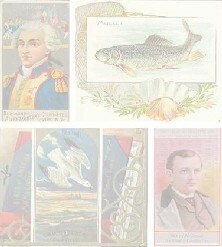 The cards were inserted into packages of MacBride’s popular confections based out of San Francisco, Ca. Check them out, and if you have any questions let me know. Sorry first time post in wrong section. Here is the moviecard.com info page, for reference.